Ever get that guilty feeling as you toss some good-food-gone-bad into the bin? Realized as you're cleaning out the fridge that you had enough food for another meal or two, if only you'd thought to check, or been more organized? Despite my best efforts I often have that realization and it really annoys me. So a while ago Sparky and I started planning our meals a week at a time. It's really helped cut down on waste, it makes writing a shopping list easier and doing the groceries less of a pain. You can rescue a stale loaf of bread by wrapping it in a clean, damp tea towel for fifteen minutes. Take the teatowel off and pop it into a hot oven for three minutes or so. Not quite fresh baked but better than tossing it. If you've bought too many veges, you can save them from an untimely end in the bin or the compost heap by freezing them. (This works particularly well for onions, carrots, pumpkin, parsnip and other root veges.) Just peel, chop and place into freezer bags, and freeze until you can use them. 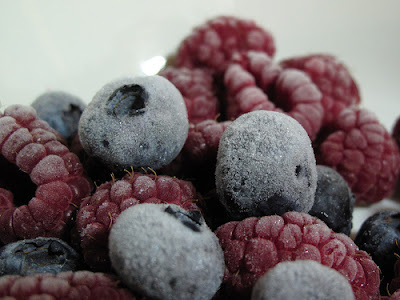 Similarly, if you have too many berries, place them in a single layer on a baking tray and freeze. Once frozen you can pop them in a freezer container until you need them. (The first step just stops them from sticking together). If you have lots of odds and ends of veges rolling about in the crisper, you can always cook up these vegetable quesadillas or this hearty soup. Both are really good ways to use up what's left and eke out an extra meal from your weekly shop. I'm constantly on the look-out for recipes like this, so if you know of any, please point me in the right direction!